Archeologists at the University of Leicster in England say they have discovered a human skeleton with battle wounds and a curved spine that could be the remains of King Richard III. Archeologists at the University of Leicester in central England say they have discovered a human skeleton with battle wounds and a curved spine that could be the remains of King Richard III. The archeological team announced Wednesday that there was "strong circumstantial evidence" that the fully articulated skeleton excavated in the third week of a dig in Leicester is that of the 15th-century king of England. 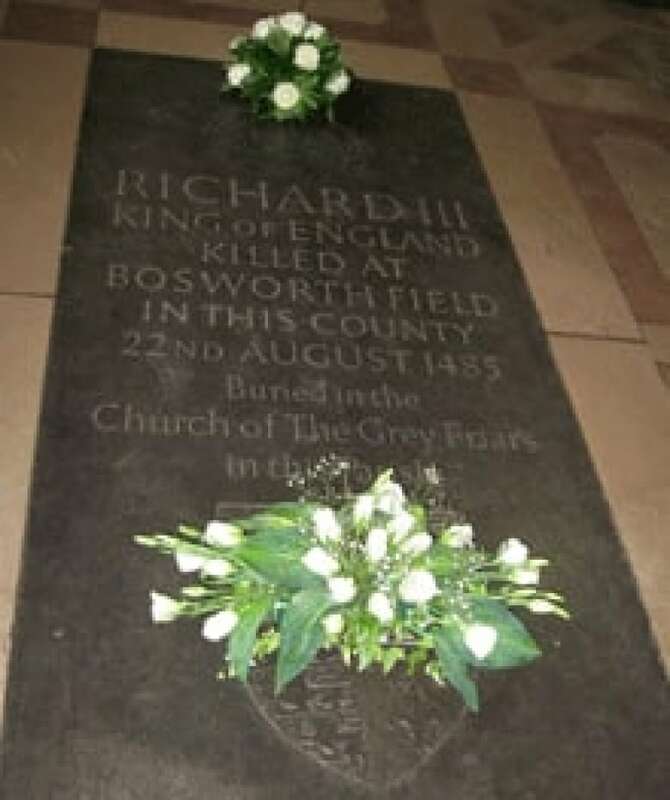 Richard III, whose reign was cut short in 1485 when he was killed at the battle of Bosworth Field, fending off the invading army of Henry Tudor, is believed to have been buried inside the church of a Franciscan friary known as Greyfriars, whose location was forgotten after the church was suppressed in 1538 when King Henry VIII abolished the monasteries. Archeologists identified a possible location for the church using map regression analysis — which begins with a current map and compares it to earlier maps to discover what has changed — and with the help of experts from the Leicester City Council and the Richard III Society began excavating a parking lot last month. The remains they found must now be subjected to rigorous laboratory testing to verify whether they are, indeed, those of Richard III, described in some historical sources as "the hunchback king." 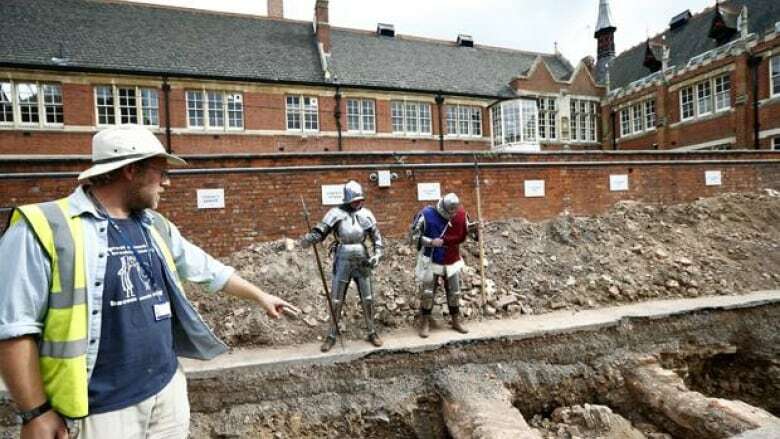 "We are not saying today that we have found King Richard III," stressed Richard Taylor, the university's director of corporate affairs, in a news release. "What we are saying is that the search for Richard III has entered a new phase. "Our focus is shifting from the archeological excavation to laboratory analysis. This skeleton certainly has characteristics that warrant extensive further detailed examination." 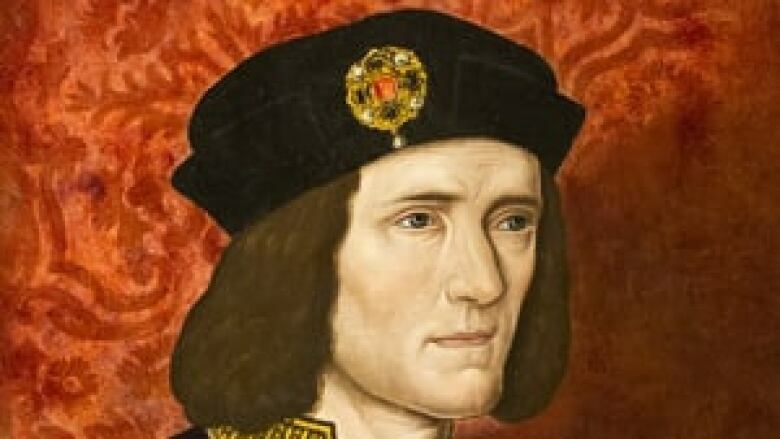 Researchers will attempt to extract DNA from the skeletal material and compare it with that of a known living relative of Richard III, a direct descendent of Richard's elder sister — a 17th great grand-nephew. "We will be hoping that we can extract mitochondrial DNA of sufficient quality to be able to sequence it," said Turi King, a geneticist at the university who is leading the DNA analysis, in the press release. "Whether we will be able to retrieve any DNA depends on the conditions of the burial — cold and dry is best for DNA preservation." The skeleton appears to be that of an adult male. The skeleton was found in what is believed to be the choir of the church, the area reported in the historical record as the burial place of King Richard III. The back of the skull appears to have suffered a significant injury consistent with a blow from a bladed implement. A barbed iron arrowhead was found between vertebrae of the upper back. The skeleton has spinal abnormalities — probably the result of severe scoliosis, which would have made the right shoulder appear higher than the left. The skeleton does not have kyphosis, meaning the person it belongs to would not have been a hunchback. The archeologists also found a second set of remains at the site belonging to a female. Richard III has often been portrayed in historical and literary accounts as a hideous villain. He was famously described by William Shakespeare as "deform'd, unfinished" and portrayed in the playwright's 16th-century work Richard III as a monster with a deformed conscience who murdered his nephews in the Tower of London in order to gain the throne. Tudor historians such as Thomas More also fixated on his physical deformity and murderous aspirations for the crown. But many other historians dispute this characterization, and there is no definitive evidence that he did kill the sons of Edward IV, heirs to the Lancaster line to the throne, which fought the Wars of the Roses against Richard's rival House of York dynastic line. Lin Foxhall, head of the School of Archaeology & Ancient History at the University of Leicester, said Wednesday that if linked to Richard III, the excavated remains might help dispel the distorted historical portrait of the king as a "wicked hunchback." "There was a long history from Greco-Roman times onward of associating disability with negative character traits, a belief that we do not share today, though it partially explains the later Tudor representation of Richard III," Foxhall said in a news release. "The individual we have discovered was plainly strong and active despite his disability. Indeed, it seems likely that he died in battle. If this person does, indeed, turn out to be King Richard III, there is the potential for a new and different understanding of the fate of the last of the Plantagenet kings." A documentary about the excavation is being produced for Britain's Channel 4 network.